Combine all ingredients into a saucepan and cook on medium heat until the tomatoes break down and most of the liquid has evaporated. This took me about 20-30 minutes. Be careful not to salt too early in this process, as the liquid evaporates the salt will really concentrate in the chili. 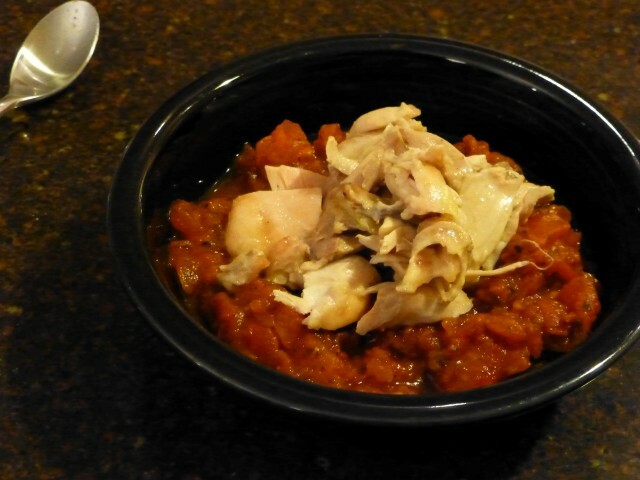 I shredded a chicken thigh to put it on top of the chili. I topped the whole thing with a couple twists of fresh ground pepper. I wish I could have had a bit of cheese on top, but that wasn’t part of my SNAP Challenge shopping list. The chili was really tasty and I would definitely consider making it again. By Tim in Food on January 4, 2013 .